Just as food seems to taste better when cooked outdoors, so does the act of cooking in an open environment seem to be more fun, more adventurous, and more family-friendly. The outdoor kitchen has become a popular gathering place during the summer months and, in many areas - all year long. 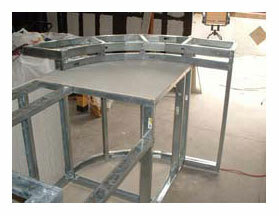 During the design phase, you'll need to determine how you want the kitchen work areas to flow. If you want a dishwasher, how close is it to the sink? Do you have plenty of countertop area between the sink and the built-in grill? You can choose from a selection of all-weather materials, including tile, marble, & stucco or stone siding. 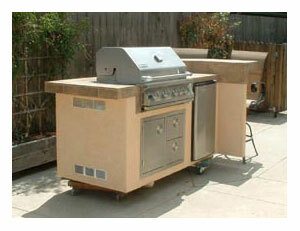 When you're ready to custom design your own, an array of outdoor appliances to meet every cooking need awaits. Wine coolers, built-in pizza ovens, refrigerator with icemaker, and dishwasher can be additional luxuries designed into your island. It's all waiting for you, so first you need to decide on a budget and a design. For a few thousand dollars, you can purchase a grill island that has all the basics. If you're not going to add all the bells and whistles, then think about convenience. Your indoor kitchen should continue working in tandem with the outdoor space. Consider an outdoor location in close proximity to the indoor kitchen for the inevitable back and forth errands. People gravitate toward fire and cooking areas and you do not want them underfoot. counter island where guests can watch the chef, the fire, and still munch on foods and chat. days and longer evenings enjoying the fire, the grill, and a tasty meal.